Second Shattered Paradise Tournament Imminent! Enlist here! Welcome back, Commanders! Bring your respirators, we're going back into the Red Zone! As most of you may know, the 3rd party mod Shattered Paradise has been released to the public in early 2019.
from April 22nd to April 24th, 2019. That's where you come into play! We are looking for the best and most competitive 1v1 players to fight in the desolate wastelands of Shattered Paradise over a prize pool of $ 50 USD. Has this piqued your interest? Sign up here in this thread or via direct message to @FiveAces on discord! Faction Choice: Players are allowed to pick factions at will on a per-game basis. All faction matchups are allowed. Welcome to the Red Zone, Commander! Last edited by FiveAces on Sun Apr 21, 2019 6:09 pm, edited 1 time in total. Re: Second Shattered Paradise Tournament Imminent! Enlist here! Last edited by FiveAces on Sat Apr 20, 2019 10:49 am, edited 4 times in total. Icesinithol sent me here, I'll join in. StolenTech here, will be joining. Also I won´t participate in this tournament like the last one so you guys are safe. 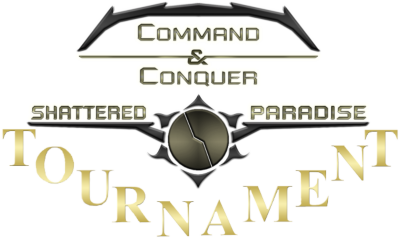 Please report in our Discord server to an Admin/Moderator that you have joined the tournament because it is quite difficult to get an overview if you guys have different names. Sorry, i can't make this anymore. Hopefully catch the stream later on though.